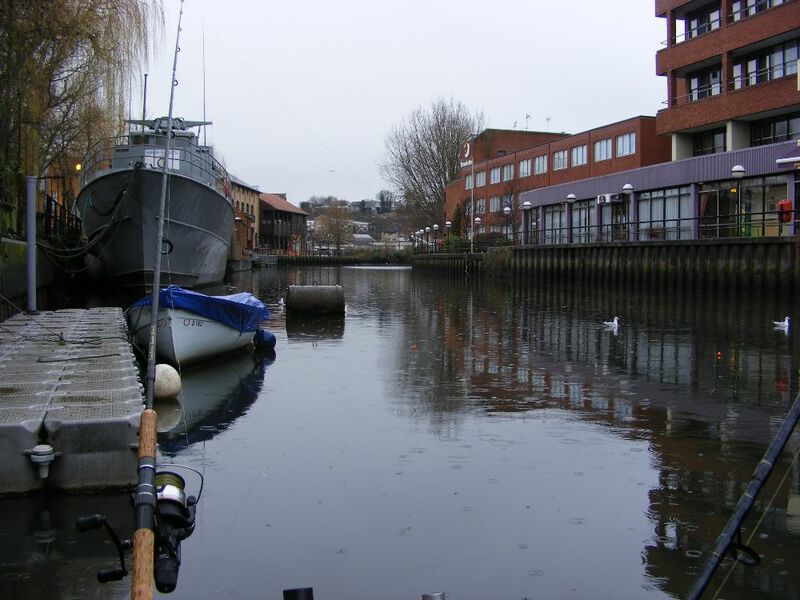 Another midweek trip on our local river Wensum started off in unusual circumstances. Myself and Dean arrived at the mooring around first light to find the river as low as I've ever seen it. The boat was clearly sitting on the muddy bottom and its mooring ropes were at their limit. It was quite an effort just to pass the gear down onto the boat and the mooring lines had to be untied at the cleats to allow us to unhook the loops. The outboard was still in plenty of water so i started her up and slowly eased out into the boat dyke. As we manoeuvred out to the river, several other boats could be seen "Hanging" on their moorings. Some had even pulled the fittings clean off ! Once out on the main river, we headed straight in towards the city centre. With the river so low, we saw much more river bank than we normally do but It was quite interesting to see how different everything looks. We decided to fish near to the hotel Nelson today and as we moored up close to the Scout boat, we could see the river was much more coloured than usual. With that in mind, i felt that ledgered dead baits may be our best option and set up one rod with a smelt and a Bluey on the other. These were positioned one close in, near to a pontoon and the other at the bottom of the near shelf. I also set up a Third rod to share with a decent sized live Roach. This was anchored mid river. It had been raining steadily since we set off and by now everything seemed to be dripping wet. Two brew ups came and went without so much as a touch on anything. Despite changing baits and moving things around we could not buy a bite so we decided to eat our lunch then move down stream if we still had not caught. The move only took about 10 minutes and we soon had the Three rods back in the water together with another live bait rod. This meant we were now fishing one dead and one live each. The tide had been "Backing up" all morning and by now the water level was almost normal again. Plenty of debris had been disturbed and it was a constant chore to keep the float lines clear. We have been fishing almost an hour in the new spot and its around 1:40pm when Deans live bait finally slides under. 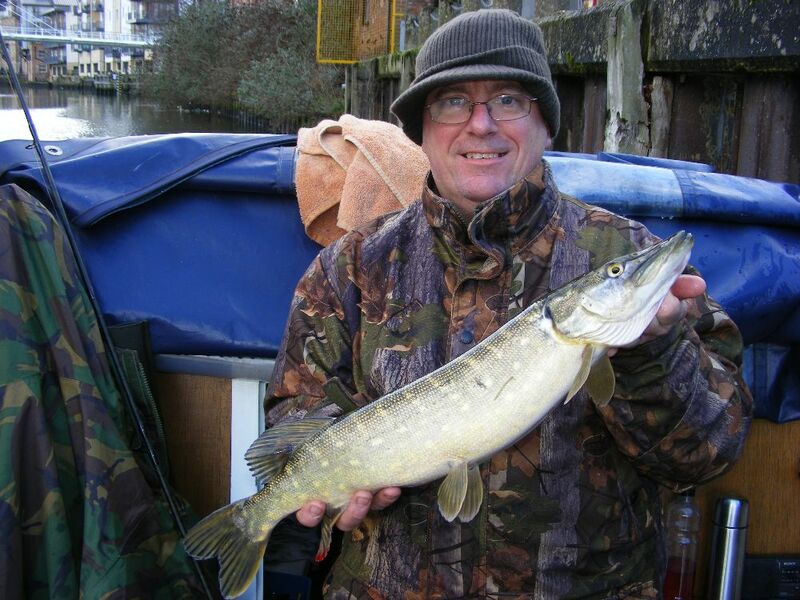 A textbook strike and he is into a fairly lively fish which after a good fight, goes 9lbs 15oz on the scales. With time running out, our 2:30pm finish time seems to be creeping up rather quickly and I'm staring at a 4th blank on the trot. I try the "Coffee trick" but that fails this time. Its like trailing 1-0 in a football match with full time approaching. I'm trying everything to get back into the game. Ten minutes left, then Eight. It gets to Six minutes, I'm just beginning to think its not going to happen and Its GONE ! The float is not there any more. I pick up fully expecting to find a branch or twig up the line but its tightening up. I lift the rod and the twig "Pulls back". Its not any size at all, but i play it like its a record breaking fish. 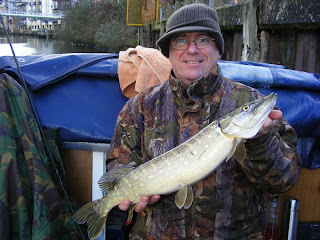 As it surfaces near the boat, i can easily hand this one out and i equalise with 5 minutes to spare. Back of the net !!! We head off back to the marina both happy we eventually caught. Both fish today were caught on a smallish 3oz live Roach. This was after Dean had fished a decent 6oz one all morning without a bite. Dean has never had a blank in Pike fishing yet, that's in about 12 outings. Not quite sure why we did not catch more today. 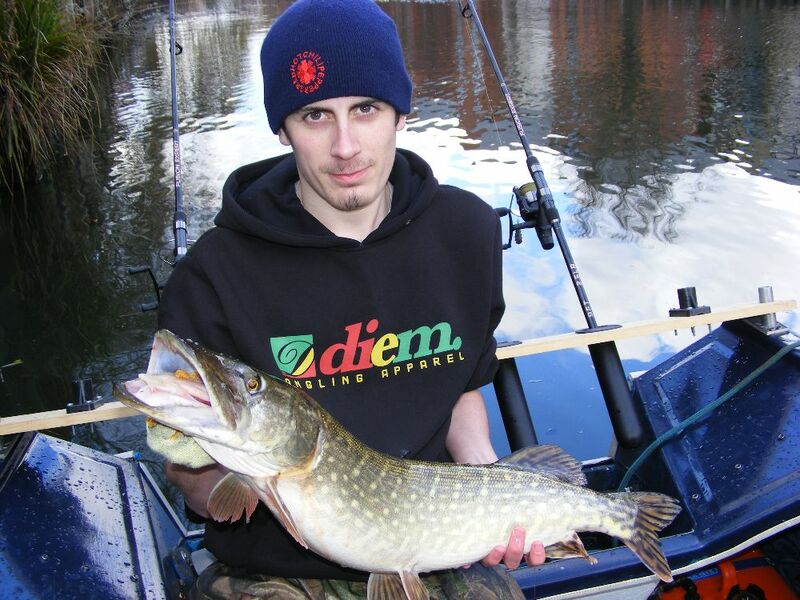 Ive done well in the past in those conditions using the oily dead baits. At least when we get back the level is much easier to unload the boat and tie up. We can see now, quite a few boats have broken fittings and mooring ropes from this mornings extreme low tide.